In this article you'll learn how to build a very simplistic miniature city for your pet lizard or tarantula to attack!! Or, if you need to create a model city for a school project, these guidelines might be what you're looking for; as the instructions for this scale model building are quite easy. If you are building this for a school project you could probably skip the sealant stage, as this is only needed if a living creature -such as a lizard is going to make this city its home. Creating a model city can be a very fun project, you just need to use your imagination and take your time. Drive around your own real city and take notes on buildings, stores, museums or other structures you might want to incorporate in this miniature project. 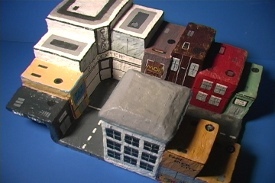 Check out the video below on how to create a miniature city. If you have a pet lizard or similar critter, you know you've always wanted to create a model city for them -on which to wreak havoc. Every pet lizard wants to be in a new Godzilla movie... Give them the opportunity to get their aggressions out! Okay, they're probably not going to appreciate it as much as you would like, but it's fun and harmless -so why not? At first glance, this project might seem ridiculous, but I assure you it incorporates everything a pet lizard needs in a structure to be put in their reptile tank. First of all it's safe, (at least the scale I made this one in is) it's not too tall as to create a potential falling hazard. It provides climbing and exercise possibilities so your pet doesn't get so bored. It incorporates two working basking spots, which can endure temperatures even higher than 120°F. And it also provides a "hide" so your pet can destress. So in actuality this miniature city includes every practical necessity a climbing/hide structure needs -to be safe and useful for your pet lizard or tarantula etc. First you want to measure your reptile tank to make sure your model city doesn't go over a certain width, height and depth. Then (using polystyrene sheets, which is Styrofoam) you want to cut out a base for the city. You want to leave a path in the middle -which will be the street and build up simple rectangular shapes around the street which will consist of the buildings. You might have to refer to the above video on how to build a miniature city in order to understand how to make the buildings hollow to provide a hide for your pet. Any type of adhesive will work, I usually use products similar to liquid nails like Loctite power grab. Be sure and create your buildings in a somewhat ascending nature, so that your pet lizard is able to climb up and down easily. Next, is the fun but somewhat messy stage of grouting. Grout is the stuff you find in between tiles in your bathroom or kitchen. For this project- grout is what gives your structure strength. You want to make sure you apply three layers of grout -all over your model city. The issue with grout is that it ultimately makes your sculpture a little bit bigger. For this reason you want to create your polystyrene sculpt a little bit smaller then what you actually want it to be. There's nothing more frustrating then putting hours and hours of work into a project like this and then not be able to fit it into your reptile tank. Once you have your three layers of grout applied, you will need to paint your miniature city. This is rather self-explanatory, but you might want to check out the video above on how I show some techniques on adding detail to your scale model building. After you paint your model city you need to seal it with a non-toxic sealant. Check out the FAQ page for a list of materials including the appropriate sealers. You want to put at least four layers of sealant on your sculpture. As the last layer of sealant is drying you'll want to sprinkle non-toxic sand on the structure to provide traction for your pet lizard. Then brushoff the excess sand after it dries, and you've got yourself a fun little conversation piece to put in your reptile tank! 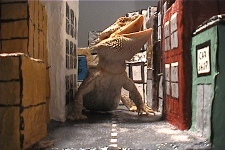 Be sure and watch the video above in which my pet bearded dragon attacks this scale model city in his attempts to get on the Godzilla movie list! Have A Great Story About building a model city?